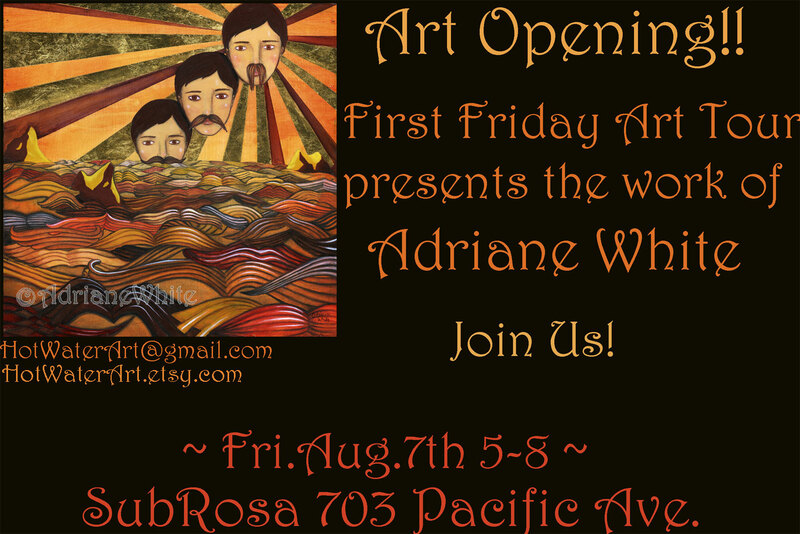 On Friday, August 7th, at 5pm, SubRosa is excited to welcome the art of Adriane White to our walls. These paintings portray her myriad feelings on performance art from weekly performances to burlesque to turn of the century stage set design. The dozen canvases in this show represent two whimsical series combined. One is of part animals, part humans, who’ve been forced into the show business against their will. The other is of a spaghetti landscape fantasy where meatballs are moons and a lone dancing foot is the star attraction. Ms. White says, "I have been in the performance arena for a long time whether it be working at a Caberet restaurant, singing in a karaoke competition or performing my own act in a burlesque show. I can't seem to shake it, I suppose, cause here it is haunting me in paint form. Maybe I just need to get it out of my system." 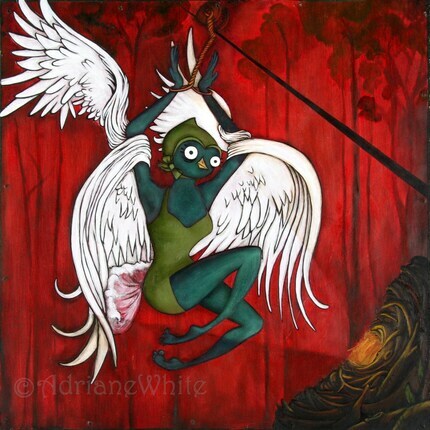 Adriane White is a long time lover of the arts and has dabbled in its many avenues. She’s studied dance and music most of her life and has appeared in over twenty theatrical plays and musicals. After receiving her B.A. in studio art, with an emphasis on photography she undertook some commercial work. Following a freak bike accident which left her injured, she turned to painting to occupy her creative energy. For prints on canvas of these paintings, contact her at HotWaterArt@gmail.com or HotWaterArt.etsy.com.